I've been specializing in treating Tennis and Golfer's Elbow for about 15 years now – Very successfully! I've even helped people whose injuries had, up to that point, stubbornly resisted all other treatments for years – And even some who were told they needed surgery. And, for the past 10 years or so, I've been teaching people with Tennis and Golfer's Elbow how to use these Advanced Massage Techniques to treat themselves at home. Can You Really Learn These Techniques And Use Them Effectively? BUT you don't have to be! The upside is that once you get the basic hang of it, you have all the time in the world to work on yourself. Instead of going in for just 1 or 2 treatments a week in a therapists clinic, like mine, (also quite expensive, honestly. I charge 145. an hour) you can apply these powerful therapies anytime you want, anywhere you want. You just need to apply them with some consistency! I truly believe Massage Therapy is the “Missing Link” when it comes to treating the true, underlying causes of Tennis Elbow. And reversing that nasty, vicious injury cycle that few things touch – Literally, few things TOUCH at ALL, except, possibly in the most superficial way. Nothing gets into and releases the “issues in the tissues,” like good, old-fashioned, hands-on Massage Therapy. And I wouldn't be surprised if you were a little concerned about this, yourself, but that's a misconception you don't actually need to worry about! Liberated from their constricting, claustrophobic braces and mobilized, released – stretched and strengthened. However, that is almost never the issue with Tennis or Golfer's Elbow. It's almost always something called Tendinosis, which is not an inflammatory condition by nature. It's a completely different "animal." I should point out that not all Tennis Elbow injuries are the same, of course. There are many degrees of injury severity, from very mild to so severe only surgery can fix it – and the nature of the injury varies somewhat. And that breakdown – the injury – is usually more gradual and microscopic. What has happened to those tendons is a degenerative breakdown process that's in desperate need of healing. It's stuck – both literally and figuratively. In the simplest terms, stuckness and stagnation are the essence of Tennis Elbow. So, what does it take to reverse this nasty, stuck state of affairs? With Massage Therapy as the key tool to unlock the stuckness. And the good news is this is something you can learn to do yourself! Tennis Elbow sufferers learn more here. Golfer's Elbow sufferers: learn more here. There are usually tons of of sticky Ahesions binding layers of muscles in the forearm together. Often without producing much in the way of symptoms that would bring your attention to it! From my perspective (and it seems pretty intuitive) this is the direct cause of the excessive load that eventually damages the tendon(s). What are people told, though? Blame “Dr. Evil” – Inflammation! – Ice it! Brace it... Rest it... Inject it! NO! Pleeeease don't do any of those things! We need to gently continue moving and to mobilize the area with Massage Therapy to bring better circulation and to literally break up the stuckness; the sticky ahesions in the muscles. And we need to stimulate those tendons – Not leave them alone. What Are The 3 Best Massage Techniques? There are TWO major goals, and one minor, when it comes to treating the muscular and tendon issues in the tissues. 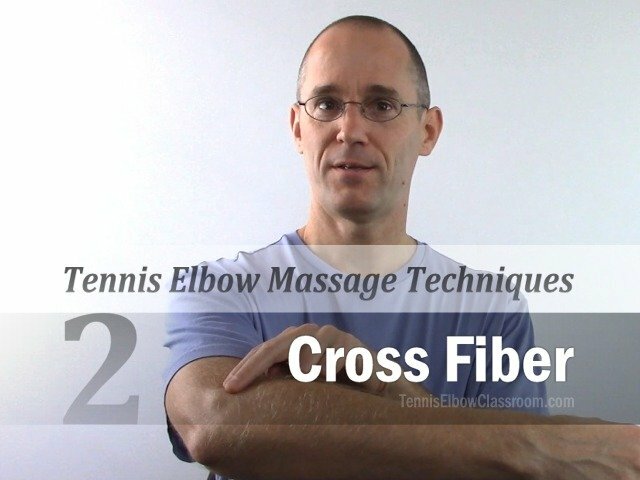 Cross Fiber Friction – A Tendon-Stimulating Technique: To encourage circulation, and to physically disturb and break the cycle of stagnation that happens in the tendons. Tennis Elbow sufferers: Learn more about the program here. Golfer's Elbow sufferers: Learn more about the program here. Actually, I have other, additional techniques and variations of those techniques, especially with Golfer's Elbow. But when it comes to Tennis Elbow the first two, 'Pin And Stretch' and 'Cross Fiber Friction' are essential. They really get at the stuck stuff that's at the root of most Tennis Elbow Sufferer's vicious injury cycles. Note: if you're looking for detailed instructions on these techniques, that's the core of what I teach my student/members in the Tennis and Golfer's Elbow programs. BUT if you have an injury that's really disrupting your life and bringing you down, wouldn't it make sense to learn the right way to perform these self-massage techniques from a pro? A professional who actually treats people by hand in person, and has decades of experience doing so, as well as helping people learn how to treat themselves? Compared to someone who is merely a virtual, online "expert" - who has never actually treated anyone in their "career?" Will ANY Massage Technique Help The Tendon Healing Process? In my perspective and from my experience, basic Massage is better than nothing, but it is often not enough. The problem is that general 'Swedish Massage' and other, similar kinds of Massage are just not specific enough. General rubbing and kneading massage is fine up to a point. There is still value in that. But more specific, advanced techniques are much more effective when it comes to addressing the issues in the tissues. It takes a certain combination of pressure and tension to efficiently break up adhesions. Yes, this does involve some work. I won't deny it or try to minimize it. However, it doesn't mean you have to spend all day on it. There is a lot to be said for working smarter – Not harder! How Effective Is Trigger Point Massage For Tennis Elbow? Trigger points are said to be highly excited, irritable spots in bands of tight muscle tissue, which often cause pain and other sensations in predictable patterns that are specific to each muscle and trigger point. And they are usually very tender or outright painful when pressed on. And as a Neuromuscular Therapist, I've found and occasionally worked on many Trigger Points in my patients over the years. However, I have never focused on or “chased” them down, or even looked at them as primary, causative sources of any given injury or pain pattern. I regard them as secondary symptoms – As in symptoms that cause other symptoms – Not the primary cause. Not the root of the problem. This does often work. The problem is that the pain relief is typically temporary. Trigger Points do not cause dysfunctional muscles. So pressing on them often doesn't produce a lasting change. We often need to do a lot more than simply treat a Trigger Point in order to correct a dysfunctional, painful muscle. So, feel free to find them if you can and press on them, but that's not going to release the stubborn, sticky adhesions that have likely formed in your muscles. And pressing on Trigger Points isn't going to do much to break the cycle of stagnation and degeneration that defines most tendon injuries at the root of most cases of Tennis Elbow. More dynamic techniques are needed to effectively accomplish that critical task. What About Tennis Elbow Massage Tools And Techniques Involving Tools? I've seen some good, some bad and some ugly self-massage tools for self-treating Tennis Elbow and Golfer's Elbow! Some tools are meant to aid in pressing very deeply on those aforementioned Trigger Points, instead of using your thumbs, which is fine if you're going to go down that road. And there are tools that are specifically designed for releasing adhesions that utilize a hard edge. You “scrape” these tools over your skin and press down into your muscles. I think the 'Graston Technique' (often performed by Chiropractors and occasionally by Physiotherapists and Physical Therapists) may be the first tool of this kind. But I have concerns about this approach. I think it's a little too easy to be too aggressive and overdo it. I've seen too many people, and pictures of people, who are all red or black and blue later on from this technique. More trauma and more damage is not appropriate, in my mind. In surgery it's to be expected, of course, and that's the exception. You can't have a surgical procedure without a certain amount of trauma and damage. But I think it's too aggressive for a Soft Tissue Therapy approach. One method that seems fairly popular is using a Massage Roller tool or "stick” to roll over the muscles involved. Rolling over these sticky, muscular adhesions we've been talking about is not an efficient way to release them. Just pressure pushing down on the muscle and rolling over it is like trying to separate Velcro by crushing it. Vercro is a good analogy for adhesions; “millions” of little hooks, hooking together and keeping it all stuck together. “Techy” explanation: We're really talking about Collagen, here. It's the common protein that tendons are made of and it forms the matrix that muscles inhabit and pull on. But the downside is, that 'cross-linking' tendency becomes a liability when it happens too much in the wrong place. And that happens a lot in muscles when they are too tight, overworked, and biochemically stressed. In the earliest stages, ahesions can simply be “stretched out” and/or massaged out with minimal effort – and prevented from getting more dense and stuck. However, as this process progresses, (think more and more Vecro hooks strongly binding layers apart) it becomes more and more difficult to release and separate them. Past a certain, early stage, you can't just easily stretch, strengthen or lightly massage them away. It gets to a point where you need that special combination of pressure and tension to get the job done. And this is usually the case, once someone has developed Tennis or Golfer's Elbow. Again, even if you just started to have telltale elbow pain of one type or the other, that adhesion process has likely already been underway for months – if not years. Ultimately, there is nothing in this world that comes close to what the human hand can accomplish. What If You Are Just Starting To Have Symptoms That “Might” Be Golfer's Or Tennis Elbow? If you're just starting to experience pain, stiffness, soreness and other symptom warning signs of Tennis Elbow, then simple, general massage may be enough to help you turn things around. Along with AVOIDING all the usual treatment mistakes, like icing, braces, Anti-inflammatory pills and Cortisone shots! Honestly, you may not need my program and my more Advanced Techniques if you're at the very earliest stage of Tennis Elbow. Then basic, general massage techniques may not be enough to break the cycle. Or messing around with lessor techniques and symptomatic remedies. Ive had tennis elbow in my right arm for 20-30 years iin my right arm but now is in both arms from delivering milk as my daily job which is very repetiitive in arm motions. Ive tried a lot of approaches including acupuncture , prolotherapy , massage, but nothing seems to have a long term effect. Its a dull aching in the forearm along the muscle and sore if I press near the elbow . What makes this program any different, as nothing else is helping. I had to stop playing tennis years ago and cant enjoy life as I should be. Geoff, 20-30 years of Tennis Elbow!? That’s terrible! Well, I’m not even going to try and “sell” you on what’s different about this program. There’s a good chance that it’s not for you, considering. I did a rescue on a jetski(lifesaving) in a storm and strained my CEO with tendonosis of triceps tendon with demonstrated linear intrasubstance tear as well as partially avulsed my radial collat ligament + tear within CEO with olecranon bursitis and small joint effusion 2 months ago. I have had no immobilization braces in that time but my pain and laxity in my RCL area is worse than ever with absolutely no healing . I saw a physio just the other day who I think did some cross fibre friction technique with some sort of electrical impluse thing as well. My condition was traumatic and I have a bit more going on than tennis elbow. I am not allowed to get back on duty in lifesaving(voluntary) until things are ‘fixed’. Will your classroom videos with massaging techniques work for my condition? I am a 2-3 times per week weight lifter, and have done so for about 5 years, and am 66 years old. 5’7″ and 135 lbs … so, as you might imagine, with a small frame, the weight is always relatively moderate. Pain on the outer bones of both elbows started 4 weeks ago, within 2 days after a session in the gym in which I was doing seated dips. It was not at all painful at the time of the exercise. Medical doctor diagnosed Tennis Elbow and prescribed arm bands, rest, ice, NSAIDs, etc., as you describe, and if it doesn’t get better in another 4 weeks, make another appointment to see him for further treatment options. I have noticed tight forearm muscles and have used heating pads and done some general rubbing / massaging, not actually understanding what I am doing, or, if it is helping. Pain is not as intense as it was initially, but there seems to be no significant improvement, and pain will flare up with light use. The questions are: With pain in both elbows, is it possible to use your self-massage methods ? Does a person need a healthy arm to work on the (other) injured arm ? Will using your methods add insult to an injured elbow while trying to massage the other injured arm ? Would this situation require a therapist, or is self-massage possible ? But at the same time, it seems to be the hardest for people who have very little hand strength to begin with. At least you’re a weight lifter and must have some baseline hand strength to call upon. If I were you, I would probably consider doing both: Seeking help, at least at first, to make some initial progress, and then working on myself more and more as things improved.